Solution: Organic chemistry is a very creative science because there are so many different reactions known that often we are only limited by our imaginations. 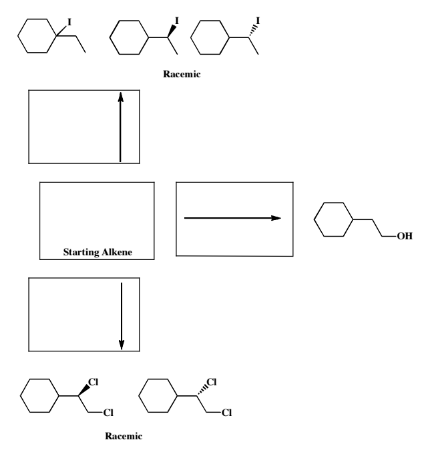 For example, the same starting alkene can be converted to the different products listed. Deduce the identity of the starting alkene, and write its structure in the box labeled "Starting Alkene". Fill in the boxes containing arrows with the reagents required to produce the given products. Organic chemistry is a very creative science because there are so many different reactions known that often we are only limited by our imaginations. For example, the same starting alkene can be converted to the different products listed. Deduce the identity of the starting alkene, and write its structure in the box labeled "Starting Alkene". Fill in the boxes containing arrows with the reagents required to produce the given products.